The most popular items are cool and functional. In fact, my favorite is a sleep shirt from Lora Leigh that I got in 2010. I still wear it. Which is actually why it’s not pictured here. Anyway it’s probably my favorite swag item I’ve ever picked up at a conference. It’s 100% cotton, super comfortable, and did I mention super comfortable? This is one swag item I wish others had made. However, pictured above are some of the assorted swagpacks I’ve been seeing at conferences. Promotional items, tucked in with useful things like tissues, lip balm, hand sanitizer, bandaids, one-use toothbrushes, and candy or mints. Or a number of other things. Romance Trading Cards were all the vogue a few years back, and I still see them. I think it’s a cool idea for people who like ebooks or books that are e-only. It’s a nice way for a reader to get the author’s autograph, and they can be put into card collector folders, or doubled up in mini photo albums. Things that are relevant to books are fun, Moira Rogers had O’Kane flasks made. Or Louisa Edwards (now Lily Everett) had champagne flutes with her book title printed on them. Now, shot glasses are popular. I have to say though – spring for the glass ones. Nobody wants to hear this, but people toss the plastic ones. (Or any ~cheap looking swag, to be honest. There were some pictures that made even me cringe after RT14 being posted where people were stuffing their hotel trashcans with swag items from the conference.) As you see, Carey Baldwin’s shot glass … is actually glass. And has her name on it! Useful and effective! Chip clips are always a go-to item. I haven’t seen many of those recently either. Jar openers are always awesome too. Tote bags. The larger the better, and especially with zippers. Here’s one I picked up recently, and yes that’s signed by Lisa Kleypas! Eee <3 I do want to say though, unless the swag totebag is standout in some way, a number of people will chuck them. And I know, I know, I said the zippered kinds are the best. But I didn’t post that kind. Exceptions can be and are made when it’s signed by Lisa Kleypas!!!! Beryond the little “survival packs” at conferences being fun and useful, I’ve also seen some of those things alone. I’ve seen first aid kits (from Laura K. Curtis) and sewing kits (from Isobel Carr) too. Everyone loves mints – nobody gets enough sleep at conferences and you do not want to have death breath. Sometimes authors go big and go all out for their first release. I ran into Laura K. Curtis a few years ago and she had chocolate bars made. With her cover as the wrappers. No kidding. And it was really good chocolate too. Belgian I think? None of that Hersheys stuff for memorable promo. And – she signed the wrappers, so that could be used as a keepsake for those so inclined. Another small but useful item is the keychain flashlight. Some of these are surprisingly bright and functional. Which is fabulous. I want to say the first one I came across was P.J. Schnyder’s. Compacts or pocket mirrors, bottle openers, wine bags … >.> yeah the community really likes their alcohol, okay? All those things are popular. I bet hand/face wipes would be really good too. I bet one would find a place where you can get them in bulk, either printed with your cover, or you could get your cover/promotional information printed on a sticker and slap that on. Sometimes (oftentimes) swag is about the impression you’ll leave on and with a person. And personally … I have to say – while a lot of people pass them over, nail files are a good thing. I’m also saying this because recently I scoured my house and couldn’t find a single one. So had I been able to secure a nail file, whatever author had that promotional item would’ve won my eternal gratitude. Of course there are many many more things someone could do to hand out as swag … but these are just some suggestions of items I liked, and noticed were popular. And the pictures were things I had readily available either with me, or that I’d snapped a picture of when I picked it up. I also asked on Facebook – you can see the conversation here. Some people also posted pictures of their favorite items in the comments, so that might give you more ideas. I know cost is a big factor. Maybe one day I’ll do a post suggesting companies that people have used and liked. We’ll see. But for now – what swag item(s) have worked for you if you’ve ever handed any out? Which ones are most memorable? Is there any swag item you got that you use regularly, or still use? 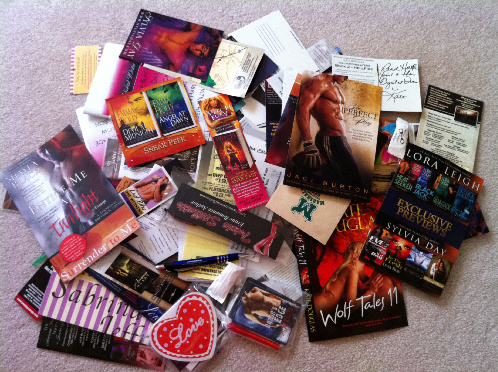 This entry was posted in Book Talk, General and tagged Author Promo, Book Talk, Conferences, General, Promotional Items, S.W.A.G., Swag on March 31, 2015 by Limecello. Charms for bracelet. Madeline Hunter sends one charm out after a new release to her team, and the charms are usually connected or related to the new book in some significant way, and I absolutely love them! Plus wine charms with book covers on them are amazing! So yeah, jewelry of any sort are always nice, especially if they’re related to a book or series. Thanks Elizabeth! 🙂 I agree post its are always nice. I keep them in random places. I guess I just didn’t think to include them this time. >.> Maybe I talked about them last time? The large block would be really cool. I wonder if people would (still) pick them up at conferences? Space is always such a premium. In every way – on tables, in luggage and so on. The measuring spoon is really cool. Did you get it at a conference? RLB – yeah I like the notepads that come with pens especially that can be tucked in. I do like some of the other things though that have uses. Oh – like eyeglass cloths! I forgot to mention those this time around. I have amazing street team swag. I was careful not to mention that stuff on your FB post.